Pork Chop gets the “1 A.M. Crazies.” That’s right. In the middle of the night, he dives off his cat perch and is ready for action. He goes on a cat-toy rampage. I attribute it to the fact that he has Attention Deficit Disorder. His eyes and paws dart back and forth from toy to toy, not wanting to spend too much time with any one item. 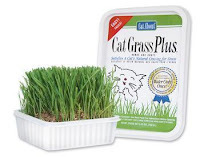 Loren believes that the cat grass I bought at Ralph’s is the culprit. Pork Chop sniffs it and chews it, and perhaps it drives him a little mad. Loren calls it kitty crack. So we put it away in the evening. But I tell Loren, “We can’t help Pork Chop. Pork Chop can only help himself.” And then I whisper the Serenity Prayer in Pork Chop’s ear.